Progressive faith is at a crossroads. Liberal pulpits ring with grand sermons about the arc that bends toward justice, and about progress “onward and upward forever.” Meanwhile, the people in the pews struggle to attend to the suffering of their souls and the tragic aspects of life. In this engaging polemic, using stories and metaphor, Nancy McDonald Ladd issues a call for change. Speaking from a rising generation of clergy and lay leaders who formed their commitments to liberal religion at the end of the optimistic modernist age, she shows how the religious life is not characterized by endless human advancement, but by lurching movement, crisis-management, and pain. With humor and humanity, Ladd calls religious progressives to greater authenticity and truth-telling rather than mere optimism. She charts a course forward that includes reclaiming rituals of atonement and lament, and becoming more vulnerable and accountable in our relationships. She shows how, together, we might build a necessary and greater resilience among ourselves and for the generations to come. “This project arises from my own discomfort at the certitude of the good liberal people I have come to love, to lead, and to serve alongside. It is also inspired by the faithfulness and courage many in my own Unitarian Universalist tradition are currently bringing to the work of dismantling of white supremacy and decentering whiteness in our institutions. This effort to build a new way of worshipping and proclaiming hope in the liberal church does not depend on triumphal self-assurance. It is fueled daily by the resilience, truth-telling, and humble courage of the people who weep and laugh alongside me during daily parish life. The people I serve tell the truth. There is a reason I can never seem to locate any tissue boxes in my office—those tissue boxes move all around the spaces we have made sacred, flowing as freely as the tears. As a minister, the invitation offered to me, day after day, week after week, is to somehow articulate the full truth of my people’s deep human experience and deeper human longing, all while pointing us forward with both hope and commitment. Nancy McDonald Ladd’s artistic and thoughtful book names what we are all thinking: that it is difficult to be in the ‘hope’ business these days. The undertow she creates with her storytelling and naming of what is real in the world drags us closer to the heart of faithful living. She calls us to the task of a deeper understanding of our faith and future with every page. 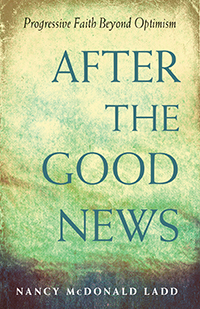 After the Good News is not just a book you want to read; it is a book you MUST read. A brilliant contribution by Nancy McDonald Ladd. She offers us a soul-stirring, historically grounded approach to theology, one rooted in her Gen X experience, and yet compelling and relevant for all; a UU theology of wholeness that meshes hope with realism, social justice, and the practical spiritual needs of our world.